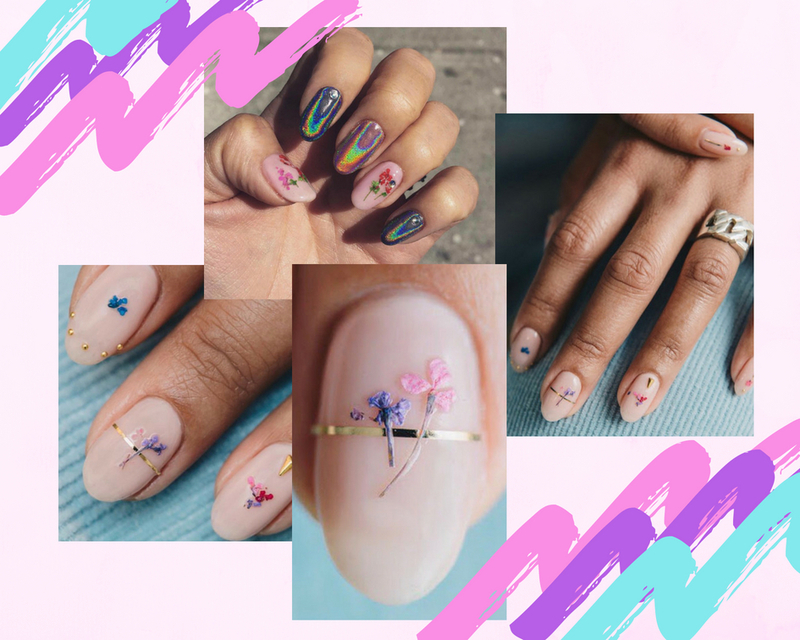 Pressed Flower Nails - The Nail Trend Everyone is Going CRAZY For! When writing about beauty and fashion, you're constantly surrounded by endless streams of trends. Some trends are great and others.... well, not so much however this trend is one which stuck out for me and there's a reason that everyone is going crazy for this! Yep - pressed flower nails! Absolutely beautiful and a trend that you definitely need to check out. Not only are they super-pretty but they're elegant and add that fun factor to your nails which is great. Across the UK, many salons have actually started using real flowers for this design which is that bit more luxurious and just makes every nail design completely unique. As you can see in this example - the nail artist has also added a gold touch to the nails which just sets the whole look perfectly. Extremely pretty and something for everyone whether you want to make a statement or keep things delicate - a great all round trend. A good thing if you're reading this post now, if you've got your holidays booked - pop to the salon before your travels and get this design. If you're someone who wants to stand out that little bit more then check out this beautiful design! You're still right on trend with the pressed floral nails however you can add a holographic touch to your ring finger for that extra statement or choose something similar to what's pictured on the left. Again, it's a beautiful design and elegant yet it's that little bit more eye-catching and has that 'wow' factor too. Have fun with this nail trend as it can be customised to suit you and your style. If you want more colour, choose more colourful flowers rather than delicate tones. I always love reading your comments so I'd love to see what you think of this nail trend! Is it something you would choose? Do you prefer delicate trends or something like the holographic touch to add more of a wow factor? These nails are so cool!! It never dawned upon me there was a such thing as pressed flowers on nails up until now. I feel so out of trends right now. I like your nails, they’re really pretty. I understand acrylic nails/fake nails are growing exceedingly popular especially over the summer. I would hope to get them as well if I wouldn’t break every single of them in one day.